The term “Jeep” has been around a heck of a lot longer than SUV. We guess the rest of the world had to try and catch up at some point. Too bad the competition still seems so far in the rearview mirror. Introducing the all-new 2015 Jeep Wrangler: after all these years it's still a vehicle in a class all its own. Welcome to the club. The new Jeep Wrangler boasts a commanding and fuel efficient 3.6L Pentastar® V6 engine ated an estimated 17 city / 21 hwy mpg. Its 285-horsepower engine provides you the power that you need along with respectable fuel economy - up to 388 highway miles on a single tank. 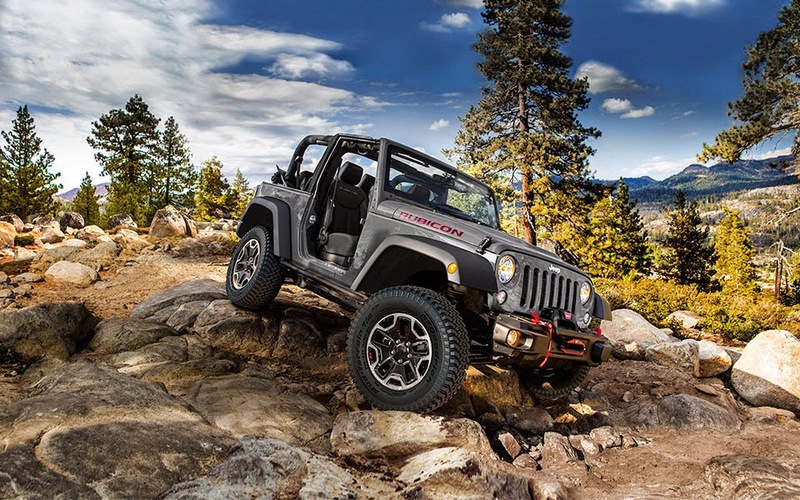 Models of the Jeep Wrangler were designed to support all lifestyles - from the adaptable Sports model to the rugged Rubicon, this Jeep will go to places other cars fear to tread. There are also tow hooks on the front and back of the Wrangler for those moments when inferior vehicles manage to get stuck and you need to put on your "good Samaritan hat". Despite its raw exterior, the 2015 Jeep Wrangler does have some finer points. Noise, vibration, and harshness (NVH) protection helps muffle noises that used to rattle a driver’s teeth, eardrums, and everything else in the past; resulting in a smooth, comfortable ride. Available leather trimmed seats, navigation system, Alpine premium sound system, and a durable washable interior with drain plugs makes this Jeep our most adaptable Wrangler yet. Seriously, how many vehicles on the market today can you literally clean with a hose? After putting together all this fun we didn't forget about the safety features. Its multistage airbags match deployment to severity of impact, four-wheel disc antilock brake system (ABS), brake assist, Hill start assist, and Hill descent control to help you manage risk every step of the way. Test drive the all-new 2015 Jeep Wrangler at the Olympia Automall today! Our expert staff and friendly customer service ranks second to none. If you're searching for new and used cars in Olympia, Wa visit the Olympia Automall. We’ll help you find the Jeep that’s right for you.